UCLA Film & Television Archive holds a collection of TV and motion picture productions by and about noted film producer and director, Stanley Kramer (1913 - 2001). Mr. Kramer began his career in the 1930s as an editor and writer, later forming an independent production company in the 1940s before moving into studio-based projects. Kramer was one of a new breed of independent producers who began operating in competition with the established Hollywood studios after World War II. Like their pre-war predecessors, the new independents rarely had the money to pay for expensive literary properties or top-name stars; unlike their predecessors, they did not for that reason concentrate on turning out formula westerns and gangster pictures. Kramer was in the forefront of those willing to gamble on relatively unknown performers and offbeat, even controversial, subject matter to distinguish his work from those of his wealthier competitors. 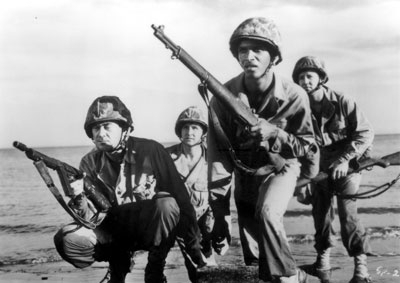 Home of the Brave (1949), often called the first Hollywood film to examine prejudice against African Americans, is an early example of the kind of social issue film for which Kramer has always been best known as a producer and in his later career as a producer-director. A notable and celebrated artist, Mr. Kramer received the prestigious, Irving G. Thalberg Memorial Award from the Academy of Motion Picture Arts and Sciences in 1961. In 1998 Mr. Kramer was awarded the first NAACP Vanguard Award "in recognition of the strong social themes that ran through his body of work." The Archive's collection includes rare interviews and TV appearances with Mr. Kramer, such as "Youth Wants to Know" an NBC Public Affairs production from 1958 which features Kramer speaking on a number of issues, including the blacklist, film as art, and labor problems. Documentary covers Stanley Kramer’s five day visit to Toronto to promote his film Bless the Beasts and Children (1971). Includes interview and career overview with Kramer as well as clips from many of Kramer’s films. Hosted and moderated by Stanley Kramer. Part 1: Roundtable discussion of Kramer's career and films includes in-studio guests Faye Dunaway, Lee Marvin, Jose Ferrer, and Maximilian Schell. Part 2 (incomplete, first hour only): includes in-studio guest Kirk Douglas, and Lloyd Bridges from the Beverly Wilshire hotel. Includes clips from many of Kramer's films, including Champion (1949) and The Men (1950). Hosted and moderated by Stanley Kramer. In-studio guests are Sid Caesar, Buddy Hackett, Jonathan Winters. Executive producer Stanley Kramer. Roundtable discussion of It's a Mad, Mad, Mad, Mad World with clips. Program also includes a segment where Sid Caesar, Buddy Hackett, and Jonathan Winters perform dramatic readings of scenes from Kramer's films: Caesar as Captain Queeg from The Caine Mutiny (1954); Hackett as Cyrano de Bergerac (from the 1950 film); Winters as Willy Loman from Death of a Salesman (1951). Guess Who’s Coming to Dinner - TV pilot ( produced and directed by Stanley Kramer; 1975)Airing once on ABC-TV, this rare, unsold 30 min sitcom pilot based on Kramer's landmark classic stars Leslie Charleson, Bill Overton, Richard Dysart and Eleanor Parker. According to newspaper reports at the time, the potential for audience rejection of the interracial themes of the program contributed to series not being picked up by the network. The Archive's general collection also includes research viewing copies of some of Mr. Kramer's most celebrated films, such as The Defiant Ones (1958), Inherit the Wind (1960), Guess Who's Coming to Dinner (1967) and many more. UCLA Film & Television Archive has preserved a number of classic feature films produced by Stanley Kramer, including Champion (1949), The Men (1950) and The Wild One (1954). Download an informal list of holdings in the Stanley Kramer Collection as a PDF document. To arrange onsite research viewing of Stanley Kramer titles at UCLA, please contact the Archive Research and Study Center (ARSC). Also note that UCLA Library Special Collections holds the Stanley Kramer papers. For more information on the paper collection, please contact Library staff directly.